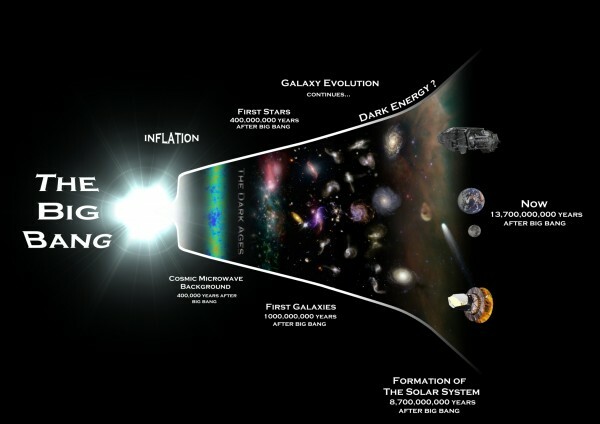 Timeline of the Universe Image credit: Rhys Taylor, Cardiff University. The Fermi Paradox asks why our galaxy hasn’t already been colonized by alien civilizations. The argument goes like this. A lot of stars in the Milky Way are like our Sun. Many of them are a lot older than the Sun. Many of these stars would have habitable planets like Earth. If intelligent life developed on some these planets, a few would have developed a technological civilization capable of space travel. Therefore, the galaxy should have already been colonized. Clearly, however, the galaxy hasn’t been colonized by an alien civilizations. We would have noticed them. For that matter, they would be here by now unless they are deliberately choosing to hide themselves from us. So something must be wrong with the arguments. The often drawn conclusion is that life or at least intelligent life may be very rare. Some go as far to say that we on Earth may be the only intelligent life in our galaxy, perhaps in the universe. While I believe it is true that many stars in our galaxy will have habitable planets, most of them may not have hospitable to life until much more recently. The Big Bang occurred 13.796 billion years ago according to latest Planck satellite data. After the Big Bang, the universe went through several phases: a rapid inflation occurring in under a small fraction of a second where the universe expanded to an enormous size, the next 3 minutes that fixed the amount of hydrogen and helium in the universe, cooling with atoms forming 400,000 year later, a dark period until 400 million years, the first stars of hydrogen and helium, the first galaxies 1 billion years after the Big Bang, then 1-9 billion year after the Big Bang galaxies begin to form and eventually evolve into their familiar structures and shapes. Our Milky Way galaxy formed about 1 billion years after the Big Bang. Our solar system formed about 8 billion years later. The real question for the Fermi Paradox is whether during that first 8 billion years of the Milky Way was it possible for life to have developed and thrived on Earth-like planets in our galaxy. It seems likely life should have arisen during that time unless life is very uncommon in the universe; however, the odds of life getting a hold in our galaxy were probably much reduced in our galaxy’s early history. During the first 8 billion years, our galaxy probably crashed into other galaxies and passed through a period of intense star formation. Recent analysis has shown that the peak of star formation in the universe was between 9 and 11 billion years ago. This would not have been easy period for life to develop or to survive for the extended time required to evolve intelligent life. Many large stars with relatively short lifespans were scattered throughout the galaxy. The death of these stars would result in enormous supernovas that would destroy life on any nearby star system. If life somehow came into being, it could have been destroyed quickly in the next galactic collision or by a gamma ray burst from a nearby exploding star. One explanation for the Fermi Paradox is simply that the conditions for the first 8-9 billion years in our universe and our galaxy were not conducive to life. Conditions were too chaotic. If we assume that life requires about 4-5 billion years to reach intelligence and consciousness at our level, as was required on Earth, then intelligent life on other planets might be roughly at our level – some more advanced, some less so – but perhaps very few with an ability to colonize the galaxy. Of those with ability to colonize the galaxy, some (maybe even most) may have had little interest in it. At any rate, the extended period of time for any of these civilizations to have colonized the galaxy might not have existed. Another explanation might be the mysterious dark energy that began accelerating the expansion of the universe. Dark energy is a hypothetical form of energy that cosmologists use to explain the apparent increasing rate of expansion of the universe. Before the observations were made that universe was expanding at an increasing rate, many scientists believed that gravitational pull would eventually cause the matter in the universe to collapse back on itself. Some had cyclic models in which the universe expanded, collapsed, and in a bounce expanded again endlessly. The nature of dark energy is not in any way understood. It seems to be a force, much like dark matter, which is required to make our observations of the universe work out according to the other laws about which we feel confident. One of the mysteries of dark energy, however, is why did it become more dominant than gravity 5 billion years ago. If dark energy had predominated over gravity in the early universe, galaxies and star systems like ours could not have formed. Life would not exist and we would not be here. This is but another example of the apparent fine-tuning of the universe for life. Could there be a connection between gravity, dark energy, life, and mind? We know the existence of life requires gravity in the early universe to form stars to create the carbon and other elements for life. Might life also require dark energy to change something fundamental in the nature of matter and space before it could come about? If that is the case, the fact that our solar system and our Earth with an ability to form life came into existence around 4 billion years ago would not be a coincidence. Life could not have come into existence earlier. David Layzer has speculated that potential entropy in the universe may be growing at a faster rate than actual entropy. In other words, we should see more disorder in the universe and less structure than we are seeing. The difference between potential and actual entropy allows for the growth of information. Verlinde’s controversial theory of entropic gravity derives gravity as an emergent property from the information associated with material bodies. Gravity and entropy may be connected to information accumulation in the universe. From gravity comes the large-scale structures of the universe. From stars and galaxies come carbon. Life can be thought of as information encoding itself in matter. And mind, of course, is yet another level of information encoding. We might think of all three as accumulation or concentration of information. This could mean that life and mind are somehow encoded in the universe in the characteristics of space. Five billion years ago, space evolved to enable the development of life. The universe is unfolding in a manner that increases information. Life and mind as we know it may only be transitory states in the evolution of something even greater. This entry was posted in Aliens, Fermi Paradox, Origin of Life. Bookmark the permalink. 14 Responses to Does This Explain the Fermi Paradox? Maybe there are here. Maybe they just are not like us, maybe they cannot be seen. It is unrealistic to think that the whole Universe looks and acts like us (God forbid). I wouldn’t necessarily expect other intelligent life to look and act like us. However, I think if intelligent life has evolved elsewhere, I think we will eventually know about some of it. A few weeks back I read Dimitar Sasselov’ excellent The Life of Super Earths. Sasselov makes a great argument based on the life cycle of stars that we are only at the beginning of the phase where the universe has conditions that are highly primed for the development of life. Up until 8-9 billion years ago stars were not producing much in the way of complex elements- most notably carbon. Now and in the future as far out as 100 billion years stars will be producing more and more of these elements- the soup of life so to speak. Life itself may arise relatively easily once heavy elements are present in a large enough quantities but, if our experience is any indication for complex life to emerge it takes a grindingly long period of time- 3 billion years in the earth’s case to emerge. According to Sasselov simple life and the universe are in the same age range- the universe were of retirement age life on earth would be 15 years old. Given all this he thinks the Fermi Paradox can be answered with the fact that we are among the first to have arrived, but given the projected increase in conditions ripe for life in the universe for a long time to come are certainly not the last. That is pretty much my thought too but wasn’t aware of Sasselov. The general argument of the Fermi Paradox is that given enough time an advanced civilization would figure out a way of expanding itself throughout the galaxy. One proposed way would be to create intelligent machines which could explore other star systems and be able to multiply themselves to explore other star systems. If this happened, then we should see evidence of the machines in our own system. The same could be done with living organisms migrating from system to system in self-sustaining vehicles that might pass through multiple generations before they arrive at their destination. In other words, distance shouldn’t be a problem if there is enough time. If the initial civilization sent out two probes and each probe sent out two more probes… well, you can see that the civilization either by machine or generational vehicles should in a billion years be all over the galaxy. In addition, we might also be able to see evidence of advanced civilizations in anomalous astronomical phenomena that would indicate construction activity on a star system scale. I heard that dark energy is the critical ingredient to holding open a wormhole which woiuld allow time travel. Maybe intelligent life has evolved and started the industrial production of dark energy in order to explore the past. And that is the reason for the rise in observed dark energy. Maybe that intelligent life is humanity’s decedents? Not sure why we would see the dark energy though without having developed that technology yet in Earth time. I am dubious, however, that time travel is really possible. If it is, then we should see evidence of time travelers (somewhat like the Fermi Paradox and aliens) unless there is some sort of Prime Directive for time travelers that prevents them causing effects on the time they are visiting. Your argument, I guess, would be that dark energy is the evidence but then that would mean there is no Prime Directive so there would be nothing to prevent them from affecting other things. I am working on a new post that relates to this that I hope you will be able to read soon. Convergent evolution principles probably determine that life elsewhere has similar if not the same DNA structure as our own. The cheapest and fastest way for our neighbors to visit here is by electromagnetic radiation information being continually broadcast to us (or to the whole rest of the galaxy). The information will be on how we can reconstruct themselves here. That info is out there now and we will sooner or later learn to see it and open our door for them. Definitely a possibility. I’ve also have wondered if there is a communication mechanism that is faster than light that we haven’t discovered. For centuries we knew nothing about electromagnetic radiation so it is possible there are other forms of energy we know nothing about now. If more advanced civilizations learn of this other mechanism they would naturally prefer that over electromagnetic so that would explain why we are not detecting signals. They are sending information. It is just in a form we do not know of yet. If two-way communication is not important it seems to me that using mere light speed info that started its journey long ago, is not important. When alien visitors are reconstructed here from the info sent out (and matured with accompanying memes, etc.) it will be to them as if they just left their previous state. Also, I read somewhere that faster-than-light fermions would have more and more energy as they approached the speed of light from the infinitely fast side. Sort of the reverse of the “more speed equals more energy” that exists on this side of the speed of light. If that holds, the extremely fast fermions on the other side of the speed of light would have extremely low energies and thus not easily detectable. But, like you say, there may be another mechanism yet undiscovered. That assumes the aliens don’t care to know what happened with their transmissions. Of course, the accepted science is that nothing travels faster than light but science is a history of finding exceptions and disproving previous “knowledge”. You make a good point about the lack of motives for one-way communications. Howbeit, the ones that care to know the results of their transmissions are likely the ones who have transmitted the info regarding making copies of themselves. I understand this would leave the original “sender” aliens out of the knowing and the only knowers would be the reconstructed copies. But I venture that your second point –about discovering a faster-than-light potential– may have a solution embedded in the very implementation of the ordinary light speed transmission. Wouldn’t it be astonishing to find that reconstituted copies here of aliens there had some sort of instantaneous quantum entanglement of their experiences? I think the theory forbids it, but as long as we’re not prohibiting the faster than light transmissions, we may as well include the sharing of experiences that are quantumly entangled.